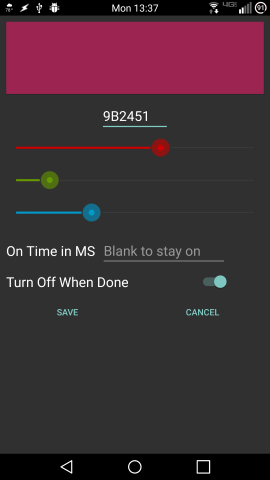 Tasker plugin that allows you to turn the notification LED light on, off, or blink for a set period of time, using whatever color you like. This app is a Locale plugin and can not be launched on its own. You must use a Locale-compatible app in order to make use of this plugin. The plugin will request an infinite timeout. When using the blink function, you must set the action timeout to be longer than the blink time to ensure the notification LED light is turned off properly.